Webmaster's Note: Because the BikeAbout team is traveling in smaller groups for a little while, we have changed the format of the journal slightly. The rider notes for the lead group (today it's the guys, who are in Lebanon) are followed by notes for the other group(s). When the group rejoins in late February or early March, we will return to the original format for these pages. The ubiquitous Lebanese bread was served with everything we ate while we were in Lebanon. Thin, round, pita-like, and usually more than a foot (and sometimes two feet!) across, it is a staple accompanying all meals. We usually used it as an outer envelope (like a pita) for different combinations of ingredients, or like a utensil, since its flexibility makes it ideal for picking up the ingredients. The bread is cooked on a very hot dome-shaped skillet. The batter is poured over the top and flows evenly down the sides. This gives it its round shape and accounts for why it is so thin. Once one side is cooked (which doesn't take very long), the bread is quickly peeled from the surface and them thrown back down on the other side. If done correctly, the inside of the bread does not cook, making it possible to separate the two sides and form a pocket where anything can be crammed. Thus, it is the perfect sandwich bread. The alphabets we know today grew out of the alphabet used and spread throughout the Mediterranean by the Romans. But what the Romans used has its origins in writing systems developed in the eastern Mediterranean, perhaps even in Byblos itself. Alphabets are basically sets of symbols used to represent sounds. These symbols and sounds, when combined, make up all the words of any language. For example, did you know that the word "alphabet" was made by combining the words for the first two letters of the Greek alphabet, alpha and beta? Alphabets differ from "pictographic" and "ideographic" writing systems, like Egyptian hieroglyphics, Mayan picture writing, and modern Chinese and Japanese. In these systems, pictures represent a whole object or idea, as in the "word" for house actually looks like a little house. In contrast, an alphabet uses combined elements to label something without looking like it. So the word "house" denotes a house but doesn't look like it. Can you imagine trying to live in the word "house"? 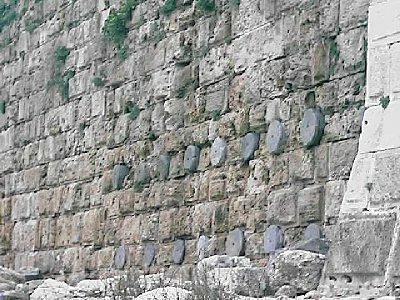 Many scholars believe that the first alphabet was only developed in about 1700 to 1500 BC in this part of the world and perhaps, as some claim, in Byblos. Old pictographic and ideographic systems were changed into a real alphabet, called the Semitic alphabet. This alphabet developed branches and grew into many of the alphabets used today in the Middle East, Africa, parts of Asia, Europe, and the Americas. One branch of the original Semitic alphabet was Canaanite, which then split into two of its own branches: Early Hebrew and Phoenician. The Greeks adopted Phoenician and then adapted it and carried it throughout the Mediterranean. The Romans picked it up and adapted and then spread it even further. The alphabet we use today is therefore the Roman adaptation of the Greek adaptation of the Phoenician adaptation of the Canaanite branch of the original Semitic alphabet. 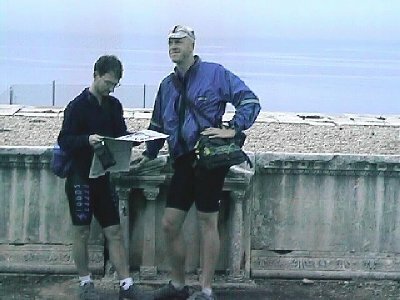 We ran into Peter Speetjens on our first day in Beirut when Leila's friend, Basel, introduced us. 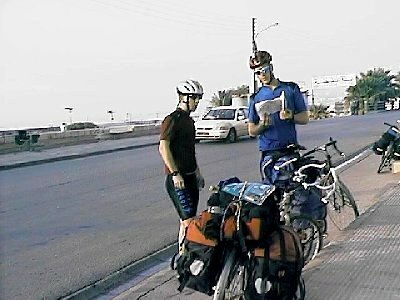 Peter, a writer for the Daily Star, an English-language newspaper in Beirut, was intrigued by the BikeAbout story and wanted to do an article about us. And that was the beginning of many interesting conversations we had about Beirut, Lebanon, the Middle East, and the world. Peter, originally from the Netherlands (but not from Amsterdam), came to the Middle East to work for Amnesty International. When his work for them was done, he traveled a bit and found himself in Beirut. There was something to the city that he enjoyed, so he decided to stay. That was 18 months ago. 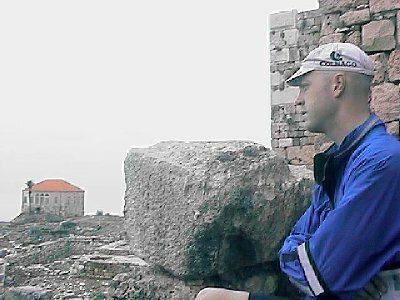 He had worked for the Beirut Times, but now covers local stories for the Daily Star. 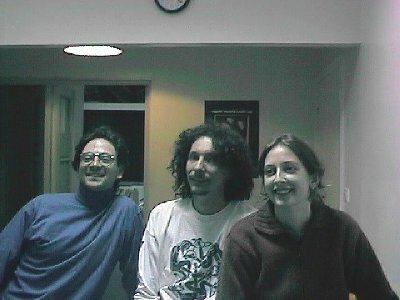 When we first met Peter, we also encountered Cynthia Zaven. Cynthia is a musician-composer and native of Lebanon. She brought great insight into our discussions about the region. Cynthia, in addition to teaching piano in Beirut and enjoying her passion for music in different places around the Mediterranean, has turned to composing. She recently wrote the music for a film documentary and is currently working with the cast and production crew of the award-winning play called "Jnaynet al Sanayeh," or "Public Garden," that includes her music. "Jnaynet al Sanayeh," playing at Beirut's Théâtre Monnot, traveled to Tunisia in October (when BikeAbout was there!) and was awarded highest honors at the "Journées Théâtrale de Carthage" ("Carthage Theater Festival"). 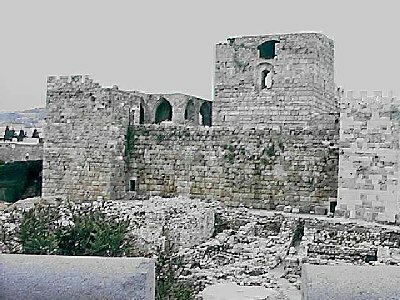 Byblos figures on the UNESCO list of World Heritage sites . . . and for a good reason. 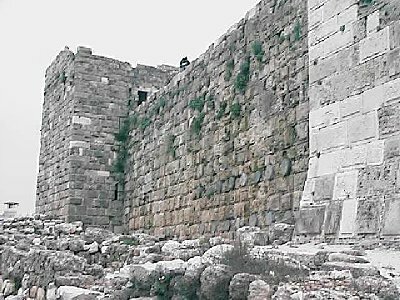 Byblos, known in ancient times as Gabel and today as Jbeil, is (like Jericho, 'Akko, and Damascus) one of the eastern Mediterranean cities that claims to have been continuously inhabited longer than any other city in the world. Today it is the site of numerous ruins going back some 7000 years to the Neolithic period. 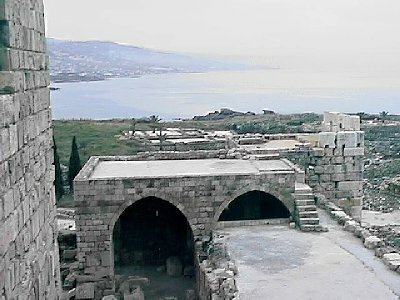 Byblos achieved its greatest renown in the third millennium BC when it was a busy Phoenician port city used for trade. 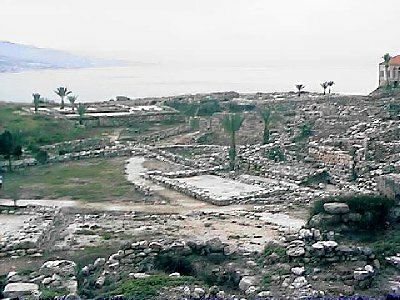 Ships from throughout the Mediterranean would come to Byblos in search of local materials, as well as those found in other further-distant lands. Egypt would send gold, papyrus, linen, and alabaster, and exchange it all for oil and wood. The trunk and branches from cypress, oak, fir, and especially the famous, huge, and sometimes ancient Lebanese cedar trees that covered the Lebanese coast and nearby highlands, were extremely important materials in the barren and arid parts of the Middle East and North Africa. 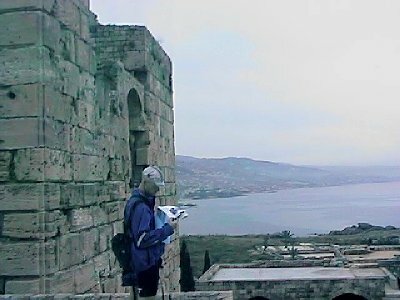 Byblos' role in shipping papyrus rolls from Egypt to Greece is even remembered today in ways most people don't even know. The word "bible" is derived from the Greek ta biblia, meaning "the books," which in turn came from the word for a collection of sheets of papyrus (shipped through Byblos), biblion, meaning "book." 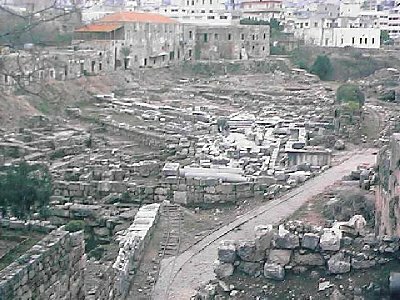 In fact, Byblos got its name from the ancient Greek word for papyrus, bublos. 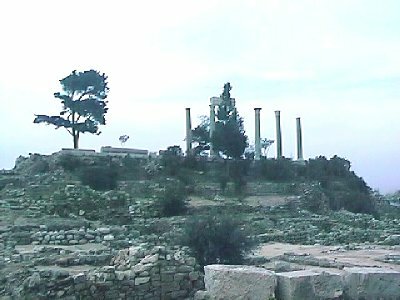 Byblos, which many scholars believe to be the place where the precursor of modern alphabets was developed (see the Tech Fact of the Day), continued to be important until the first millennium BC. Following that, it was invaded, as was the whole region, successively by the Persians, Alexander the Great, the Romans, the Byzantines, the Arabs, and the Crusaders. 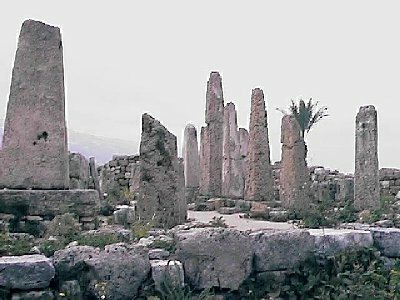 Afterwards, many of its ruins were covered over and lost from memory. Standing proudly above it all is the heavy Crusader castle. 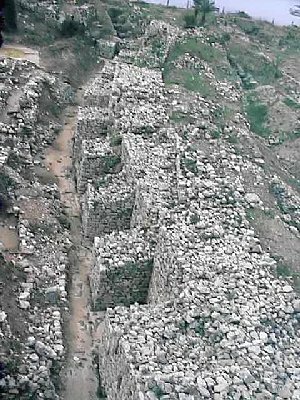 Using the rock salvaged from older structures (even Roman columns were used ), the Crusaders built thick outer walls around an equally dense keep. The best views of the entire site are from the roof of one of these outer walls. 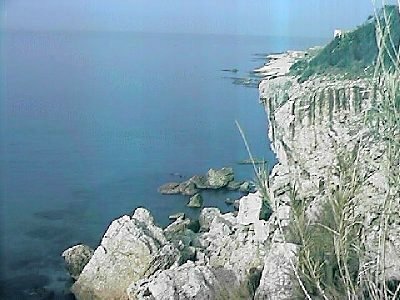 You can see the nearby beaches, and even down the coast toward Beirut. 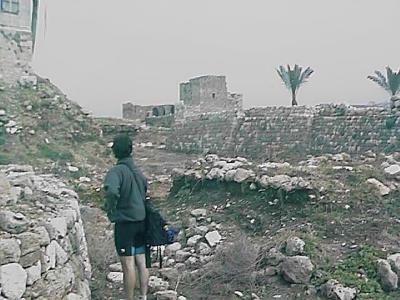 Surrounding the dominant Crusader castle are a wide selection of ruins: the remains of huts from the fifth millennium BC, a few temples from the third millennium BC , tombs and an obelisk temple from the second millennium BC, shrines and a rebuilt theater from Roman times , and, of course, some impressive Medieval walls. We spent a pleasant morning exploring the grounds, pretending to be giants (almost as tall as Anthony) in the Roman theater , and imagining what it would be like to be trapped in a thick-walled castle during long sieges. Padraic and Anthony agreed that the only reason why the three guys would be attacked in such a place was because Anthony's attempt to grow a goatee (small beard) was disturbing to the goatee experts of Lebanon. Padraic and Ethan vouchsafed that the best way to protect themselves from an attack by the Brotherhood of Goatee Artists would be to sacrifice Anthony to them. Or shave him. 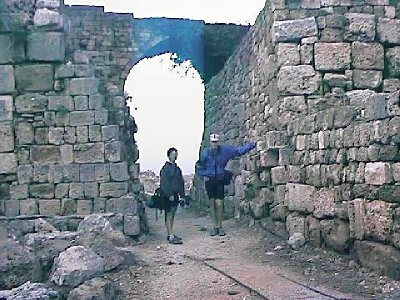 Byblos, also known as Jbeil, is only 36 km (22 mi) from Beirut. We figured this distance would be easy to cover, and, after an early start, leave us plenty of time to visit the city's ancient ruins (see the Place of the Day). However, last night's late splurge kept us in our beds and to a slower pace than we could have anticipated. After getting up late, getting our bags (which were located in a different apartment), repacking, and saying our goodbyes, it was already 2 p.m.! Still, we had been reassured earlier last night that the road to Byblos was tolerable and would only take a couple of hours. Well, it did take only a bit more than a couple of hours, but nothing could have prepared us for the road . . . and nightmare traffic. We had already grown more or less accustomed to the traffic in Beirut, which is more outrageous than anywhere we have been. Not in terms of speed, but rather as a function of its unpredictability and, for lack of a better word, compactness. Yes, compactness. In Hamra, there are times when it is impossible to walk! The cars — true kings of the road, taking priority wherever they go — turn, roll, and even accelerate in such a way that crossing narrow streets can be an adrenaline rush. Even more astounding is the precision with which they stop, slipping into small spaces between other cars, pulling up within inches of the car in front. It is no exaggeration to say that walking between cars is downright perilous. And biking!?! When they heard we were on two wheels, most people looked at us like we were bananas, coo-coo, loony. Who would dream of trying to navigate such an endless flow of metal-hided beasts doing their best to get where they have to go with a near total disregard of other forms of transportation? Well, BikeAbout would. And we were gently bumped and buffeted on plenty of occasions as we chose to push aggressively through gridlock that would otherwise take no heed. Anyway, confident that city traffic is usually worse than anything found on the roads elsewhere, Ethan, Padraic, and Anthony headed — slowly and carefully — to the city limits. And, after a confusing "short cut" through the port area, we hit the only road out of town: the Highway of Hell. Basically we feel lucky to be alive. Stuffed into five official lanes were enough cars to clog all seven unofficial lanes. Interwoven and braided, the rows and rows of cars stretched for 10 km (6 mi)! It was a true swarm of vehicles, trapped beneath a polluted mist, revving and shifting as the flow allowed for a pointless lane changes or the opportunity to "speed" ahead by a few feet. We had never seen anything like it in our lives. Or, at least, never had to bike through anything like it! Fortunately, though, despite the slow speed and tight quarters, there was usually enough room for a bike to slip through, so we bobbed and weaved and did what only bikes can do. Darting carefully between bumpers and avoiding too much contact with cars, we actually succeeded in making progress (more progress than most of the cars!). Still, it was tough and unsettling work. We had to keep our eyes open for traffic in our direction, turning traffic, over-eager and/or incompetent drivers (especially of taxis), man-eating potholes, and hundreds of other perils on our obstacle course. 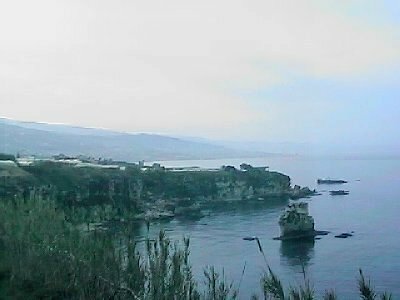 Finally, after Jounieh , traffic began to thin out and we found an alternative route for the scenic push up the coast to Byblos. Byblos, our Place of the Day, is famous for three basic things: first, it claims to be one of the oldest continuously inhabited cities in the world (see more at the Place of the Day); second, Byblos is believed by many to be the place where an alphabetic phonetic script was developed which grew into the modern alphabets we know today (see more at the Tech Fact of the Day); and third, Byblos got its name from bublos (which today means "book"), the ancient Greek word for papyrus, because papyrus was delivered to the Greeks from Egypt via the port of Byblos (which also gave its name to the "Bible") — see more at the Place of the Day. 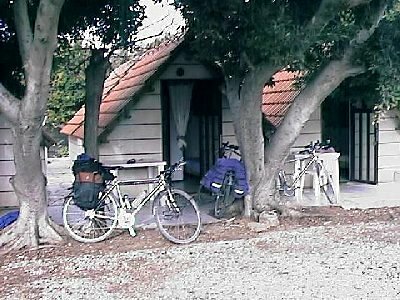 As the sun set off the Lebanese coast , Anthony, Padraic, and Ethan pulled into the only reasonably priced accommodations in town — a campground overlooking the sea — and squeezed (all three) into a tiny "tungalow," a bungalow in the shape of a tent, with two beds and a shower. (Ethan slept on a mattress on the floor.) After showers, we wandered into town, enjoyed a big chicken meal, and then staggered home to bed. Meanwhile, the ladies were still visiting Cyprus and Rhodes. You can read about their journey in their February 2–8 dispatch. Internet access while in Lebanon was provided by Nethopper.